Two decades after Nelson Mandela became president, South Africa’s post-apartheid generation will vote for the first time in next week’s general election. The ruling African National Congress represents his political legacy, but that’s undermined by the party’s weak economic results. Maybe the “Born Frees,” as they’re known, can help change that. South Africa’s economic growth, at 1.9 percent last year, may only reach roughly 2.5 percent in 2014 and 2015, the IMF reckons. In contrast, the rest of sub-Saharan Africa saw its combined GDP expand 5.9 percent in 2013 and that could accelerate to 6.5 percent growth in the next two years. Given South Africa’s population is increasing at a 1.3 percent annual rate, according to the World Bank, the per-capita economic improvement is even more anemic than overall growth suggests. Of course, the country is already rich compared with its neighbors – a GDP per head of $11,000 at purchasing power parity in 2012 was more than four times the regional average. That makes South Africa uncompetitive in labor-intensive industries. But investment would help, and there it lags badly, with incoming capital only 19 percent of GDP, per the World Bank, as against 31 percent in Ghana and, for instance, 35 percent in India. The ANC has held the country together, no mean achievement, but has fallen short when it comes to the economy. In the past 10 years, corruption has worsened and economic freedom has declined, according to rankings from Transparency International and the Heritage Foundation, respectively. Those trends deter private investment and entrepreneurialism, and even the Pretoria government hasn’t invested enough in infrastructure, with tight electricity supply a particular problem. These factors in turn have brought persistent unemployment, currently at 24.1 percent according to Statistics South Africa, and other signs of trouble like persistent mining strikes. In her book “The Bright Continent,” Dayo Olopade describes young Africans’ use of the term “hippos” to describe their entrenched, often elderly, rulers. The term fits for the ANC’s elite, in power since Mandela and coasting to re-election under President Jacob Zuma. Yet 40 percent of South Africa’s roughly 50 million people were born after 1994. Maybe a more outward-looking younger generation can teach the hippos a thing or two – and help push South Africa’s economy toward its neighbors’ growth rates. 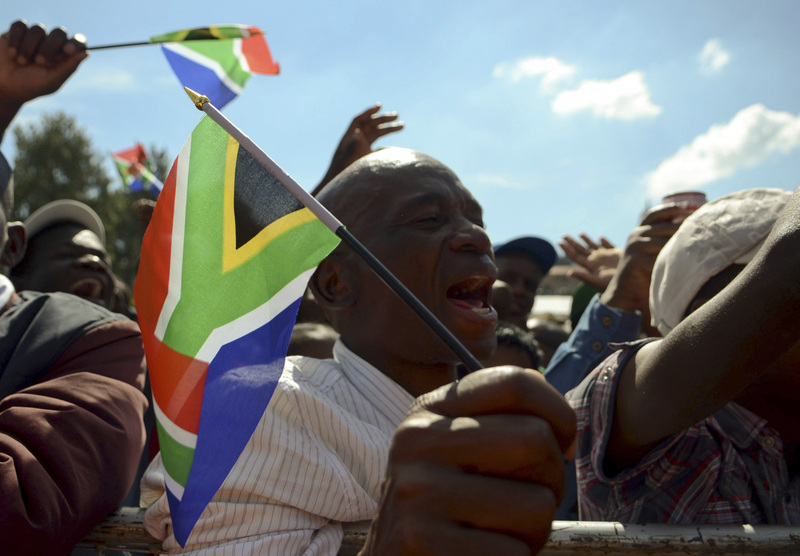 South Africa’s general election will be held on May 7. The new National Assembly, elected for a five-year term, will then pick the president. The African National Congress currently has a strong lead in opinion polls and its leader Jacob Zuma is expected to be re-elected president. “Born Frees,” or South Africans born after the inauguration of Nelson Mandela as president on May 10, 1994, now number some 20 million, or 40 percent of the population. The IMF in its latest World Economic Outlook estimated South African growth at 2.3 percent in 2014 and 2.7 percent in 2015, with inflation at 6 percent and 5.6 percent respectively and unemployment fairly steady at around 25 percent. South Africa ranks 75th of 178 countries on the Heritage Foundation’s 2014 index of economic freedom, down from 53rd 10 years ago, and 72nd of 177 according to Transparency International’s 2013 corruption perceptions index, down from 48th a decade ago. It ranks 41st of 189 countries on the World Bank’s 2014 Ease of Doing Business list, but only 150th on the sub-ranking for access to electric power.